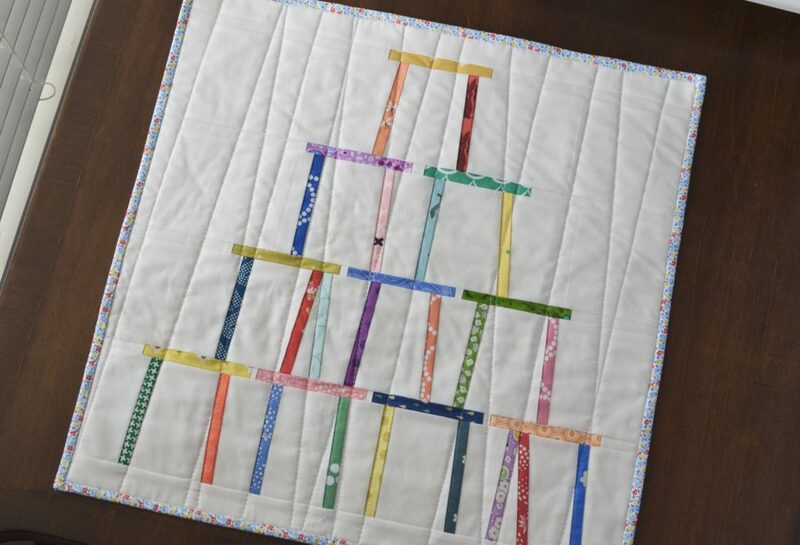 You can dig through your scrap bins for this project, or make it a coordinated design! If you opt for charm squares, how many you use will depend on how much print variety you want in your mini. 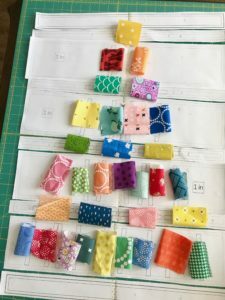 ***A NOTE ABOUT SCRAP SIZE: Larger pieces are easier to work with for beginners to paper piecing. 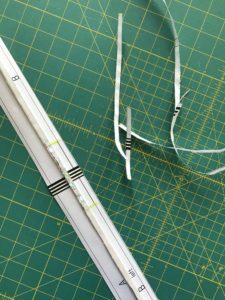 If your scraps are a bit wider or longer than these guidelines- don’t bother cutting them down any smaller than ~2″ x 5″. The extra will be trimmed away. Alternately, if you are an experienced paper piecer- you can get away with scraps as narrow as 7/8 in for this pattern! For my sample version, I used a rainbow of small scraps of all different makes with Kona Snow as the background. 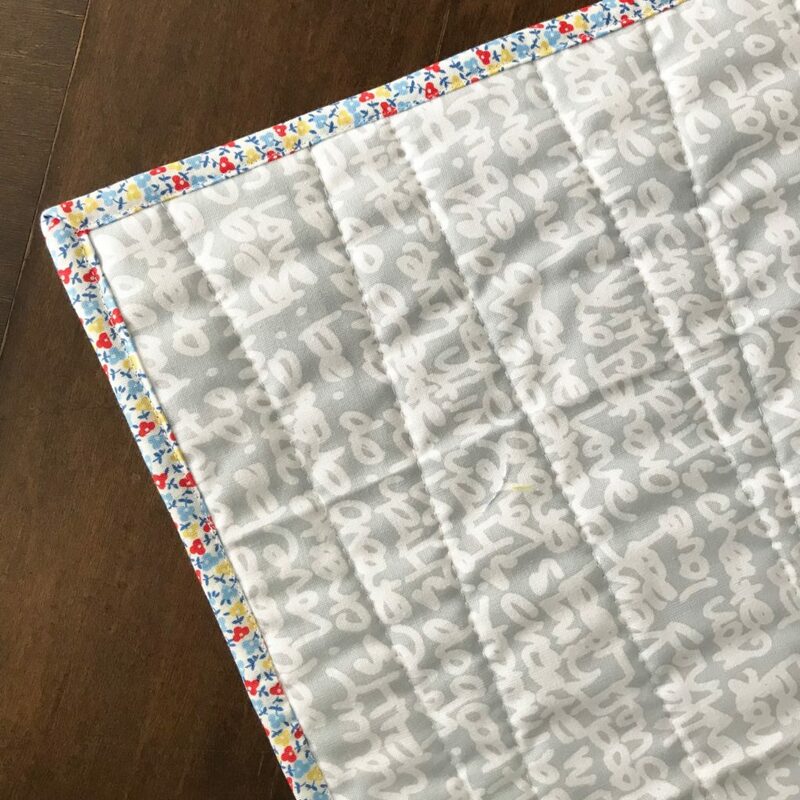 For my new version, I’ve opted to use charm squares halves from a single Bonnie & Camille line, Vintage Picnic, with Kona Ash as the background! 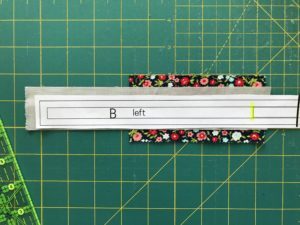 Print all pages of the PDF pattern pieces at 100%. 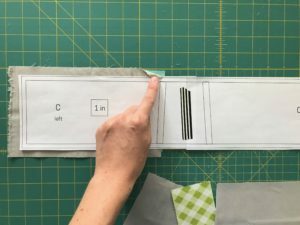 Measure the 1 inch square to ensure the pattern is printed at the correct size and adjust if needed. 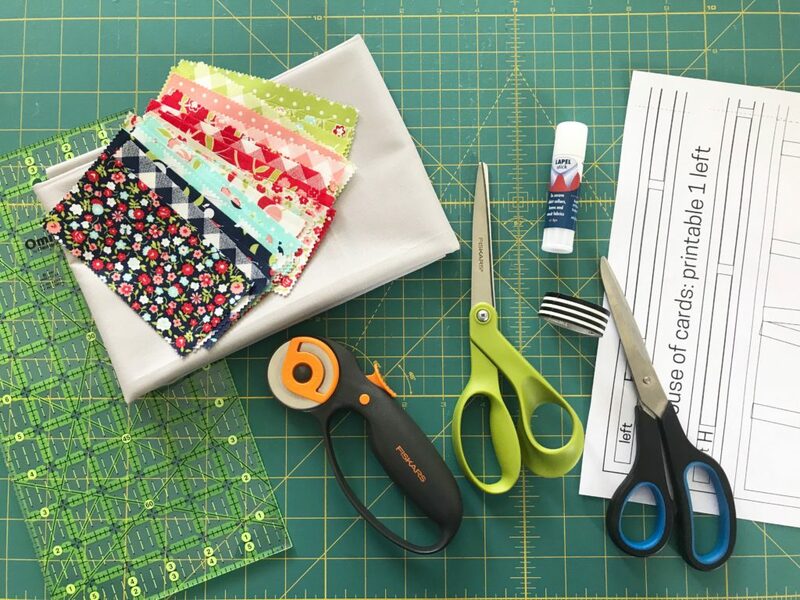 Cut out all the paper pieces with your regular scissors, but NOT on the lines! 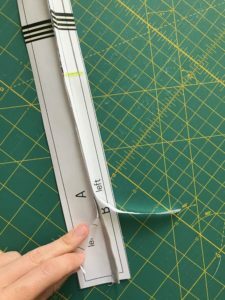 When cutting foundation paper pieced papers, you will want to leave a little extra room around the outermost outline of each piece. Group your paper pieces by lettered section. You will notice the papers are all lettered and half are labeled with “left” . 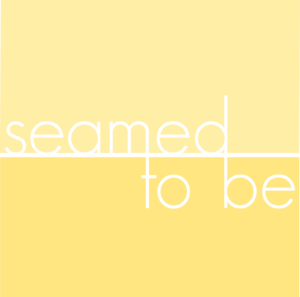 Each lettered section has two halves that need to be joined. 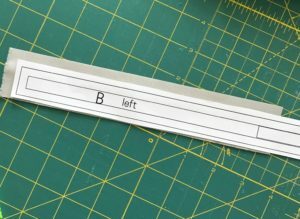 On the right half of each section, trim with your scissors directly on the dashed line. Arrange sections alphabetically A-J, top to bottom. At this point I like to plan the layout of my scraps so I can be sure to get an even scattering of my colors! I make sure to snap a photo so I can refer back to it as I piece my sections. 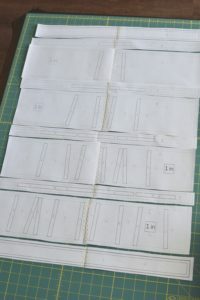 One thing to note, is since you paper piece on the back of the papers, right side down, your final product will be the mirror image of this layout when it is finished. These sections require no piecing as they are made up of one single background rectangle. 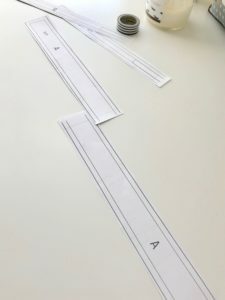 Paper is still used in this step in the interest of stability and accuracy. 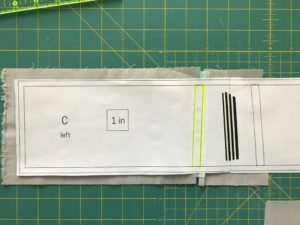 Once you have found a place it will fit, apply 4-6 dots of glue with your lapel stick to the back of the paper and adhere it to the wrong side of the fabric. 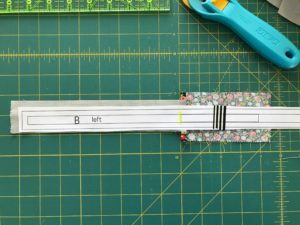 Line up the 1/4 inch line on your ruler with the inner outline of your piece A or J. 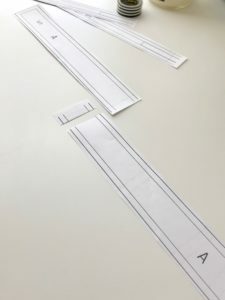 Line up the edge of the ruler with the outer outline. 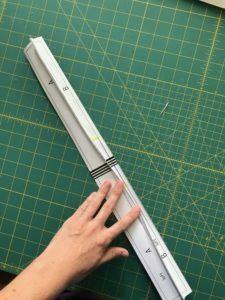 Careful to keep your ruler in place, (paper is slippery! 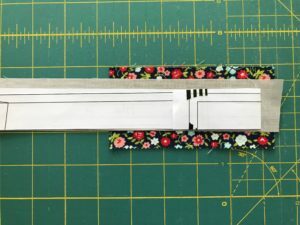 ), trim with your rotary cutter around all four sides of the outer border of piece A or J. 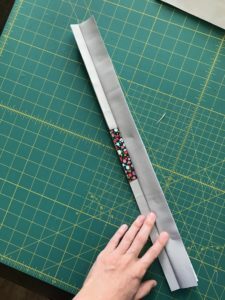 Turn your trimmed section over- it is finished! Set aside and repeat for J. 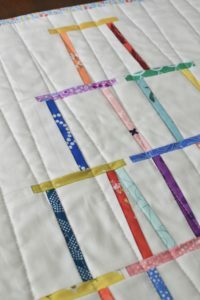 The rest of the sections require simple foundation paper piecing. I will provide instructions and photos for sections B & C as examples. The rest of the sections require the same treatment! 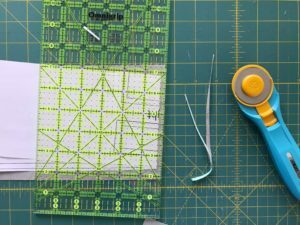 If you are brand new to paper piecing, it might be helpful to view a video tutorial to better understand the method before you start. We will be working from LEFT TO RIGHT for all sections. 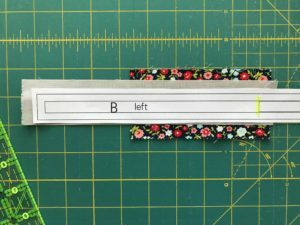 Set your stitch length to 1.5. 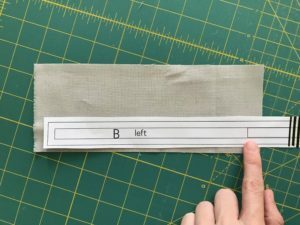 The tiny stitches will help perforate your paper for tearing away later! 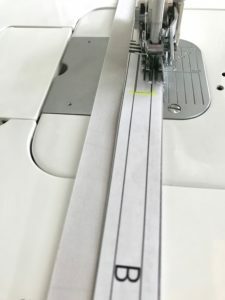 In foundation paper piecing, you will be sewing on the top of the paper and unable to see your fabric while stitching. It feels weird and confusing at first, but you’ll get used to it! A dry iron is recommended as the moisture from steam can cause the paper to curl and be harder to work with. Start with the leftmost piece of the section, a background piece. The “cards” vs background are not shaded differently on the pattern pieces, but you can do this quickly with a pencil if you think it would be helpful. 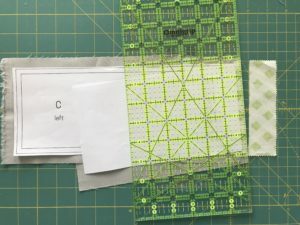 Place the paper piece onto the WRONG side of the background fabric, being sure that the fabric extends at least 1/4 inch beyond the vertical stitch line. 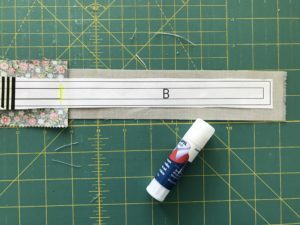 Use your glue stick to secure the paper to the fabric and cut the background fabric roughly to size, leaving a little extra around the edges that will be trimmed away once the section is complete. It’s time for the next piece, your first “card”! 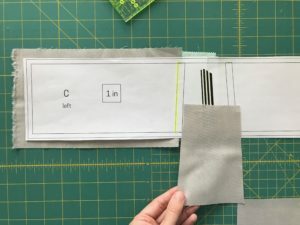 Place your card fabric right side up, below the background fabric. 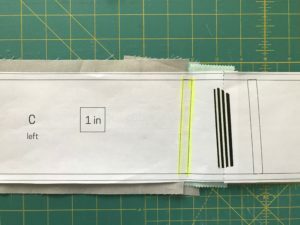 The two fabrics should be right sides together (RST) just like in a normal seam. 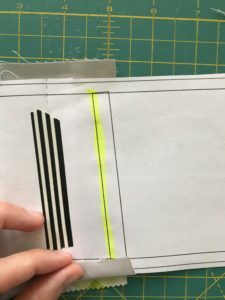 Be sure the card fabric extends, (just like the background fabric), at least 1/4 inch beyond the highlighted vertical sewing line. Stitch on the line, starting a few stitches before, and ending a few stitches after the line ends. 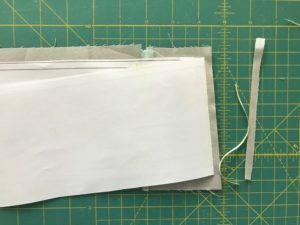 You will have sewn through three layers: the paper, the background fabric, and the card fabric. 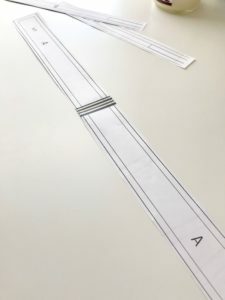 Fold back the paper on the sew line to reveal the fabrics. 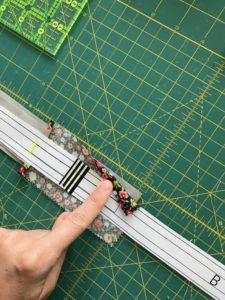 Using your scissors, or a ruler and rotary cutter as pictured, trim a 1/4 inch seam allowance from the stitched line/folded paper. Unfold the paper back to its original position. Flip your work over. 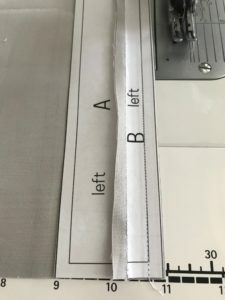 From the right side of the fabrics, briefly press the seam. Next, press the card fabric away from the background. 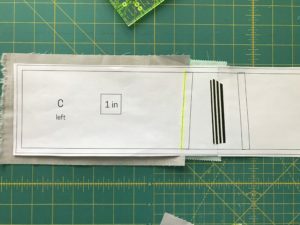 When you turn your work back over and view it from the paper side, the card fabric should now completely cover it’s area from below, beyond the outer outlines, with at least 1/4 inch extending over the next sewing line. 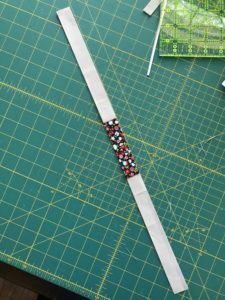 Cut your next piece, a strip of background fabric, to an appropriate size. You will join this in the same way as you joined the last piece. 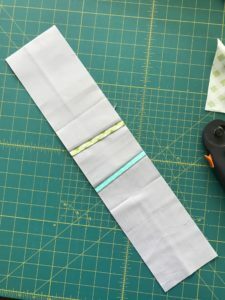 Place the strip underneath the card fabric, being sure that it extends at least 1/4 inch beyond the sewing line. Stitch on the highlighted line. 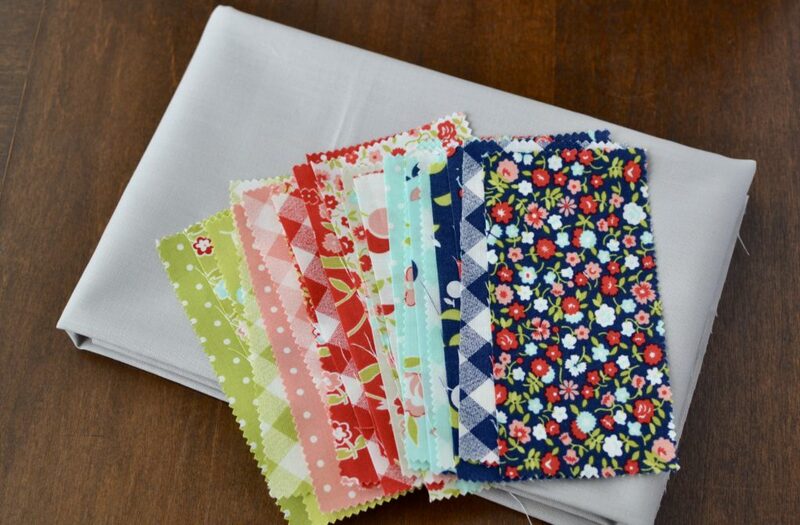 Fold the paper back on the sew line to reveal the fabrics. 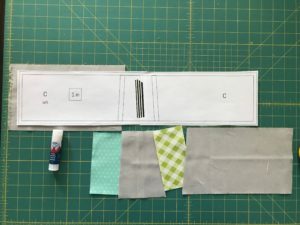 From the right side of the fabrics, press the newly added background strip away from the card fabric. 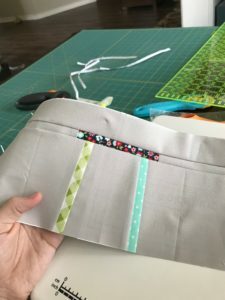 When you view your work from the paper side, the background fabric should completely cover its area from below, beyond the outer section outlines. Apply a few spots of glue to keep this last piece in position. 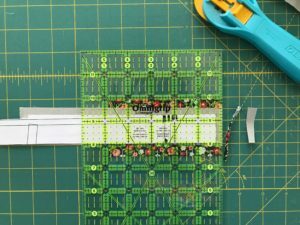 Line up the 1/4 inch line on your ruler with the inner outline of your section B. 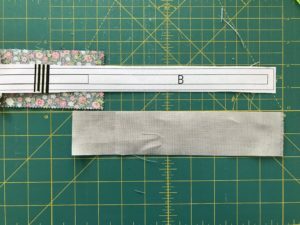 Line up the edge of the ruler with the outer outline and trim. 17. Turn your trimmed section over- it is finished! Set aside and proceed to the next lettered section. The following are instructions for Section C- skip if you’ve got the hang of it! 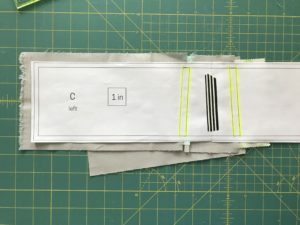 Cut a piece of background fabric for your first section, or go ahead and prep them all! 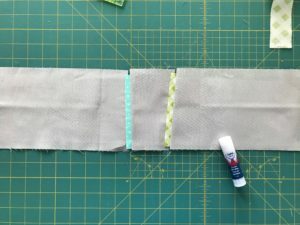 Glue stick the paper to this first piece of fabric to hold it in place. Position the next piece- card fabric- underneath the background fabric and over the stitch line by at least 1/4 inch. Stitch on the highlighted line, extending slightly before and after the line. 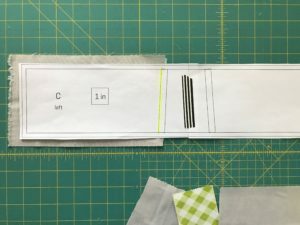 Fold back the paper and trim your seam allowance. 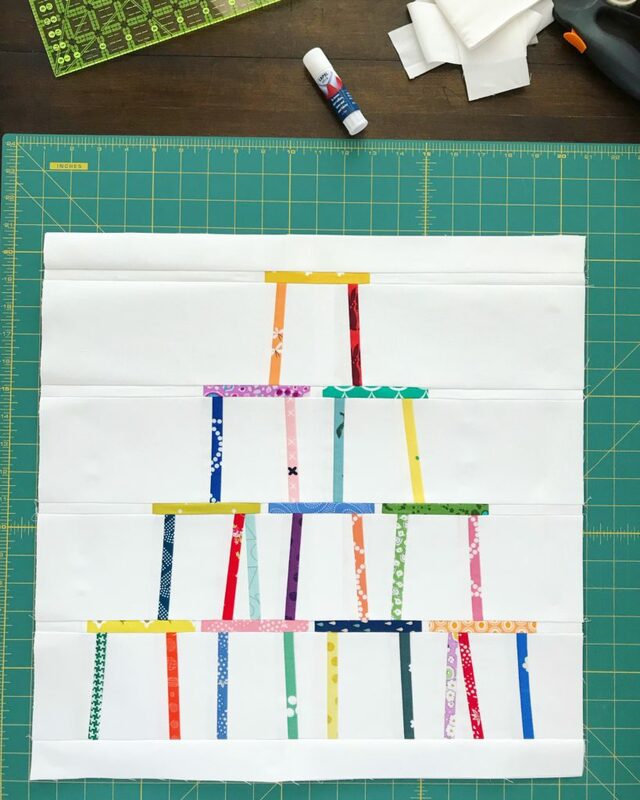 Unfold the paper, flip your work, and press the card fabric away. Flip. 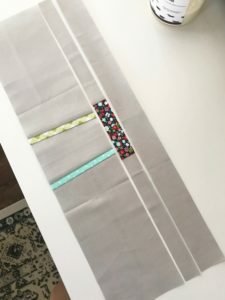 Select your next piece of background fabric, being sure it is large enough to cover its area as well as 1/4 inch seam allowance on every side. 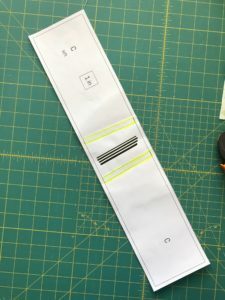 Add this piece, stitching on the highlighted line. 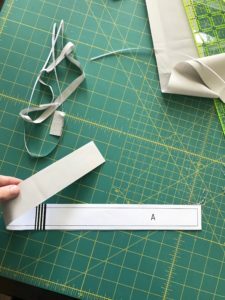 Fold the paper back and trim the seam. Unfold the paper and flip your work. 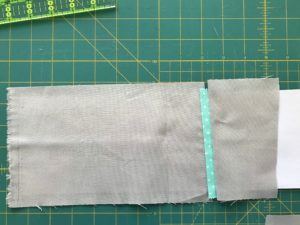 Press background fabric away from the card fabric. Below is how it will look from the fabric side after pressing. Flip your work to the paper side. 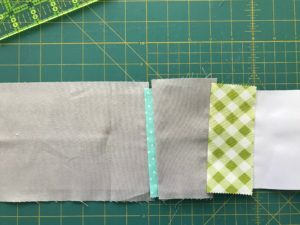 Add the next piece, card fabric. Stitch on the highlighted line. 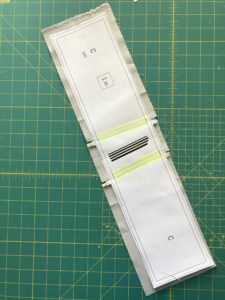 Fold back the paper and trim the seam allowance. Unfold paper, flip your work, press card fabric away. Add your final piece of background fabric for section C. You will notice I have to angle the piece I am adding in order for it to cover the space it needs to when pressed. Stitch on the last highlighted line. 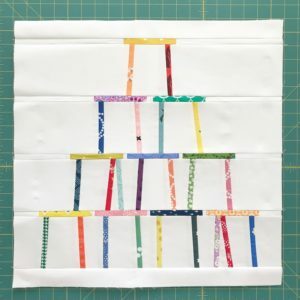 Unfold paper, flip your work, press background fabric away. 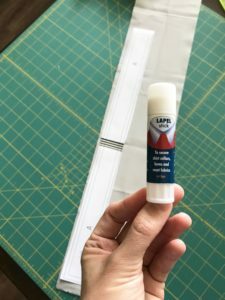 Use your glue stick to secure this piece so it doesn’t flap around. 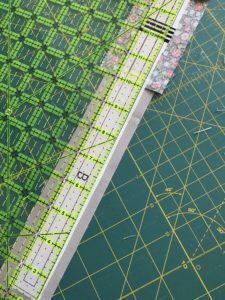 Flip to the paper side and view your almost finished section C.
Trim with your rotary cutter on the outer outline. Use this same method of construction for sections D-I. Once you have all of the sections A-J made and trimmed, you are ready for assembly! Use this photo as a guide for placing your sections. 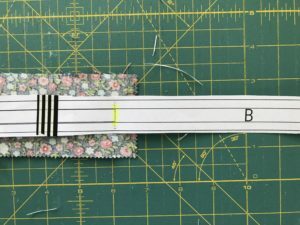 Join section B with section A by placing them right sides together and stitching as you usually would to piece two blocks together. 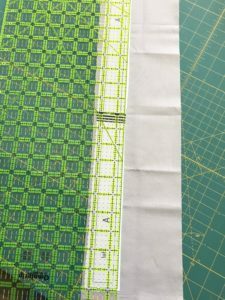 The difference is you will be stitching through the layers of paper as well. All sections have been trimmed on the outer outline. 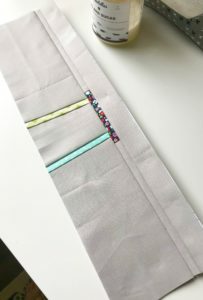 You will stitch on the inner outline, providing you with a built in 1/4 inch seam allowance. Gently open up section A away from section B, smoothing and pressing with your hands. I like to flip mine over, paper side up, and bend the seam back and forth to work it flat. I do not usually use my iron at this point unless it is very unruly. Section A and B are joined! Below are photos of AB being added to section C. See step 7 for alternate method. 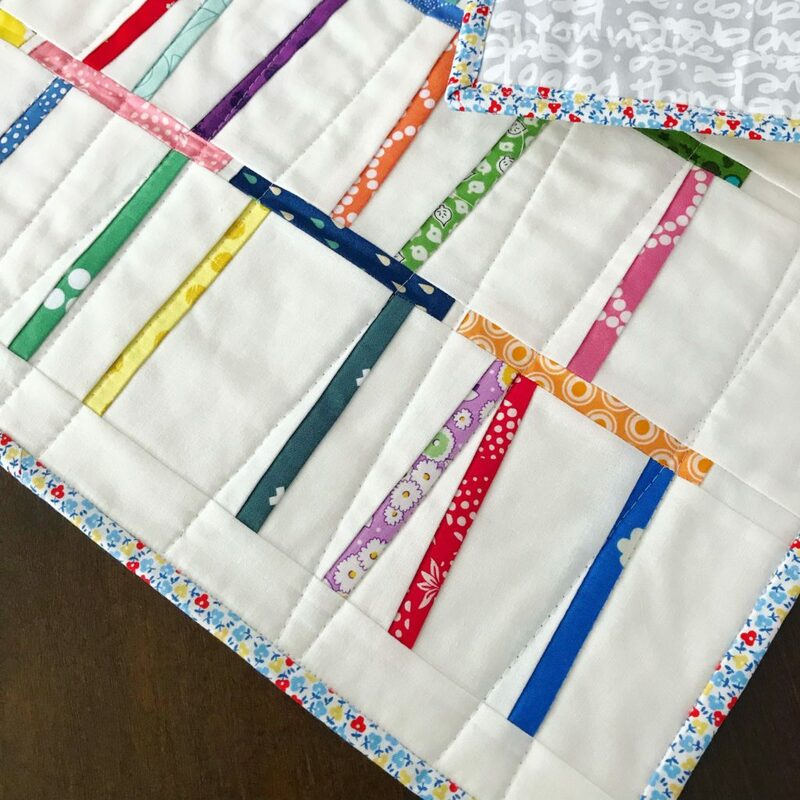 You may continue to join in pairs (like A & B) and then join those pairs together until all the sections make one completed quilt top! 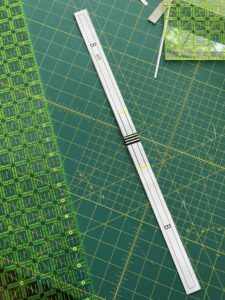 This can help reduce the risk of any distortion from adding subsequent rows one at a time. That is how I assembled my rainbow mini. 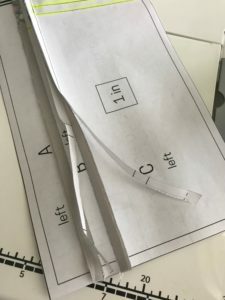 Once all your sections are assembled together, it’s time to remove the papers! 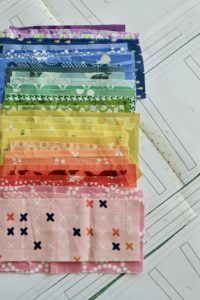 Gently fold the papers back and forth along each stitch line and tear away. Be sure and get them all! 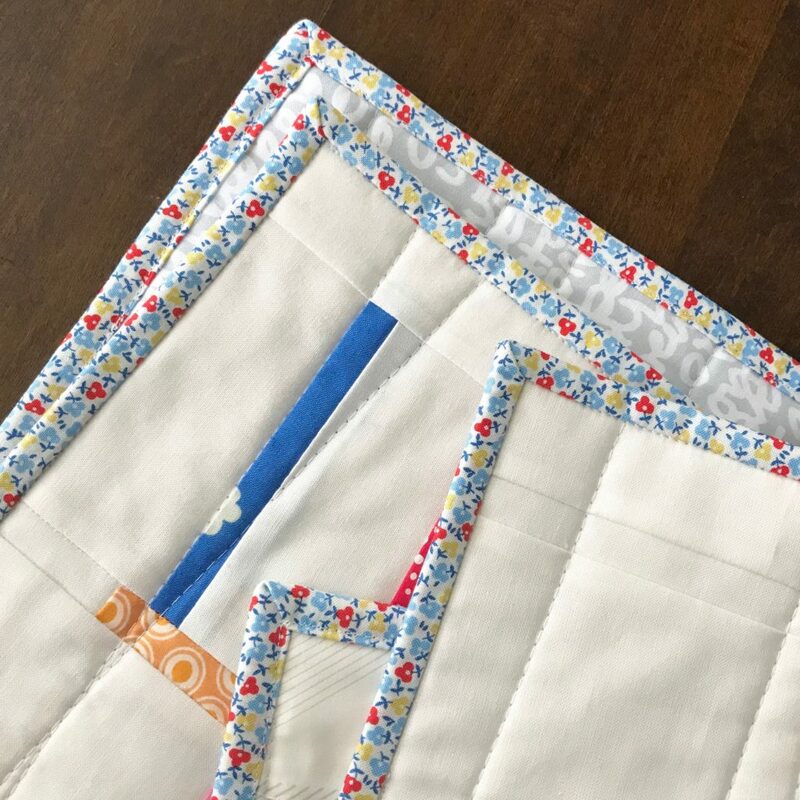 Press your mini quilt top. 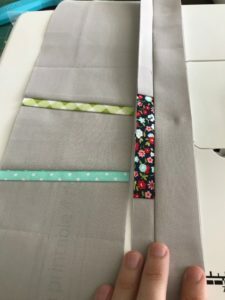 I recommend pressing from the back first, pressing seams away from the skinny sections B, D, F, H.
Baste as desired with your batting and backing (backing fabric right side down). 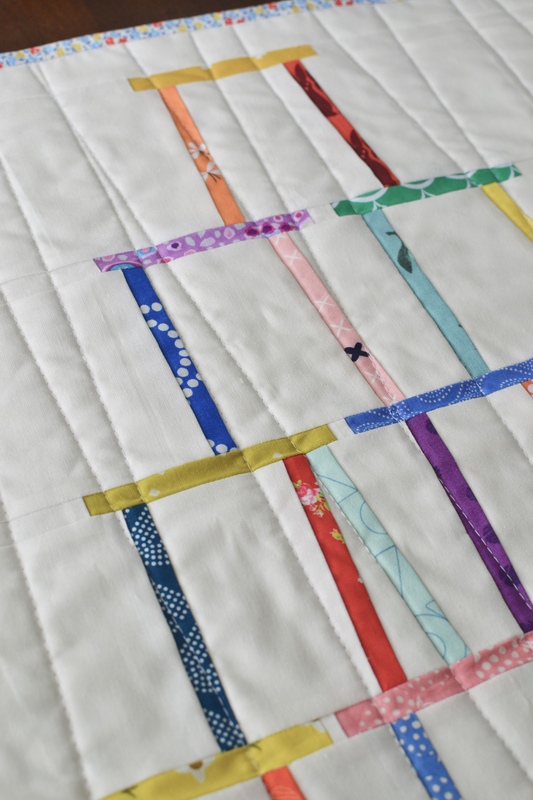 Make and attach binding just as you do with your full size quilts. Finished size is approximately 19 5/8 wide by 19 1/8 inches tall.